"You're a miracle worker. Miracle workers don't give up." Agh! Such a great pair of lines. Perhaps we don't all have an award winning writer and producer like Shonda Rhimes to name us 'Gladiators,' while costuming us in white hats insinuating we're one of the good guys. But we're ALL miracle workers. Yes, that means YOU! In tiny ways, like breathing and regenerating cells, and having 5 senses, we work the miracles. Actually, those aren't really tiny at all, they're kind of huge! But they happen with very little effort, they're like the miracles that run in the background. You know what makes us miracle workers in the big ways -- in the foreground? We are all unique, like no one else, put on the planet for our own special reason. What's your special reason? No really, think about it. Recently, a group of my friends encouraged me to work with a particular life coach with whom they are all working. My friends are having breakthrough after breakthrough in their careers and relationships. It's inspiring. I'm incredibly happy for them. I've tried to articulate why I'm not interested (right now) in employing their coach. I mean, I'm all for asking for help and guidance when I'm stuck. I just don't feel stuck. I don't have all the answers - or any of them - but I do know I'm a miracle worker. And miracle workers don't quit. (As I was recently reminded.) Working with someone right now would feel like I've given up on myself. There's a whole world of gifts and abilities I've not even begun to tap into. There's a well of actions I need to take on my own before asking for a stranger's help. Here's what I've really come to - the last 18 years of my life I've lived with others. I've cared for them, fed them, made joint decisions with them, and spread myself out for the benefit of others. (I benefited plenty from all of them as well of course.) This is the first time in a really long time that I'm putting myself first. And ya know what? I feel like I'm a gladiator with a crisp new white hat to take on the world. I feel like Lady Amazing. No one can do what I can do. No one can do what YOU can do. We're miracle workers. Let's get to work! A tiny miracle in my kitchen this week too! A client sent over a recipe that I couldn't imagine turning out well. Warm cooked lentils over crisp romaine lettuce with a yogurt based dressing. What?! Get some lentils and lettuce! Create this miracle for yourself! Thank you JJBegonia! I overcooked the lentils a tidge so it didn't photograph as beautifully as the original. But we don't eat pictures, do we? It was delicious! For the Lentils: Place the olive oil in a skillet set over medium-high heat. Add the carrots and celery to the pan, and cook stirring occasionally, until softened - about 5 minutes. Add the shallot and garlic to the pan and cook for an additional minute. Add the bay leaf and water, and lentils to the pan, and bring to a boil. Cover and reduce the heat to medium-low, and simmer until the lentils are tender but not mushy. Once cooked, remove from the heat, and stir in the lemon zest. Set aside while you prepare the Caesar salad. For the Caesar Salad Dressing: Place all of the ingredients in a blender or a food processor, and pulse until smooth. 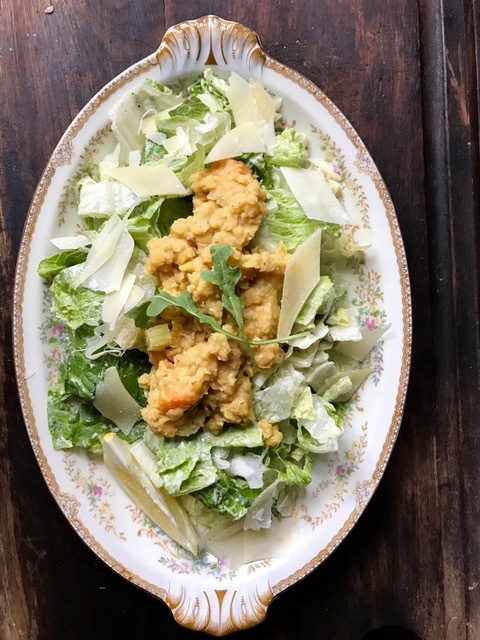 For the Salad: Toss the romaine with the Caesar dressing, and plate. Place the lentils over the top, or for an extra fancy restaurant-style presentation, place the lentils in oiled ramekins, refrigerate for at least one hour, and turn out onto the lettuce. Serve with lemon wedges, and top with extra greens, if desired.